When is a good time of the day to train? What is a good time of the day to train? In an article in The Observer newspaper on 3 February, the advice was that the morning was the best time of the day to train. The article was titled: ‘The Benefits of Being An Early Riser’. It suggested that getting out of bed early increased productivity, happiness and health. It also led to desirable personality traits, such as persistence and the ability to cooperate. The inference is that morning was a good time of the day to train. While not disagreeing totally with this, we would say that different people benefit from training at different times. And we would go one step further and suggest that different types of training, aiming for different results, can be affected by the time of day training takes place. The reason is physiological. Hormone levels fluctuate throughout the day, which will have an impact upon performance, particularly muscular performance. The hormone fluctuation that takes place in our bodies is related to our circadian rhythm. This is the 24-hour cycle that controls our sleeping patterns, our metabolism and our hormone levels. It reacts to things such as light/dark, food intake and exercise. Under the circadian rhythm, our nervous system and hormonal production fluctuates during the day. Hormone levels peak at certain times, drop low at others. Understanding this, will help you understand how to train optimally. Or at least understand why you sometimes feel better in the gym than at other times. A typical 24-hour period includes times when you are in your deepest sleep (2.00am). You have your sharpest rise in blood pressure at around 6.45am. The highest testosterone secretion occurs at 9.00am; best coordination at 14.30pm. You will enjoy your fastest reaction times at 15.30pm. Greatest cardiovascular efficiency and muscular strength occurs around 17.00pm. The fact that most athletic records are set in the mid-afternoon to evening time are testimony to the impact of a body’s biorhythm. Studies in weightlifting and cycling have shown measures of strength and power to be highest in the afternoon or evening. And we can use these patterns to understand and enhance our own training and performance. Only a few research studies have looked at the relationship between muscle growth and training times. One 10-week study assigned a group of subjects to morning training (7am-9am) and a second group to afternoon training (5pm-7pm). They followed the exact same training programme. 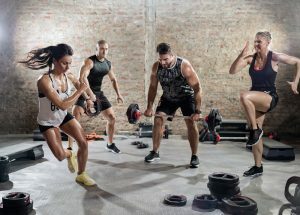 Results showed the afternoon group had a 3.5 per cent growth in muscle size, as compared to 2.7 per cent in the morning group. This is not a hugely significant result but it should be noted that muscle growth is a slow process. Had the study been over a longer time scale, the results might have been more significant. The results have been partially explained by the fact that testosterone (a muscle growth hormone) increases after training and the rise in testosterone after exercise has been found to be greater in the evening. However, despite what the science tells you, there is also the vital important aspect of lifestyle and what suits you. For example, if you enjoy training in the morning and always feel tired in the evening after work, is there any benefit on following the science and training in the evening because that is when your biorhythms will see the greatest muscle size increase? The answer has to be no. Even if you get an improvement in muscle size, this is countered by the fact that you are training with less energy, you are more prone to illness or injury and you will lack motivation because you feel tired. Despite what the biorhythms might say, the optimal time of the day to train has to be when you are feeling at your best: motivated, energetic, focused and without a pressure of time. For further information and advice on training, please chat to one of our experienced personal trainers in the Outlooks Gym.